A while back, the Milwaukee Journal Sentinel featured a story on the completed renovation of All Saints Parish in Milwaukee. 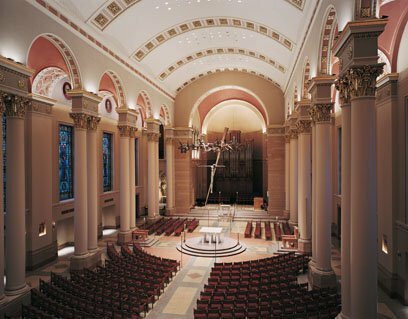 Stories of church renovation are nothing new to Milwaukee Catholics. The city offered a high-profile case in the early 2000s with the controversial and unfortunate renovation of Saint John the Evangelist Cathedral, located in the heart of downtown. The renovation of All Saints opened the door once again to a much-needed dialogue (that never happened) regarding the interplay of architecture, design and, most importantly, theology in Catholic churches. I am one of many Catholics who believe that “renovation” is more often than not code for the evisceration of tradition. Unfortunately, over the past several decades, we have witnessed in America a slapdash, willy-nilly approach when it comes to the so-called “renovation” of our Catholic churches. Is there a deeper agenda behind these renovation projects? The contrivances of church renovation aim to replace the overtly structured and hierarchical churches of old with what is often described as a more “welcoming” or “open” prayer environment. The new setting for Catholic worship, suitably egalitarian and modish, succeeds in blurring the lines of distinction between priest and laity. Most typically, renovations involve the following: the altar is brought out of the sanctuary and further into the nave of the church, the altar rail is completely uprooted (see article below), pews are replaced by chairs arranged “in-the-round,” and quite often, the tabernacle housing the Blessed Sacrament is isolated from the main body of the church and relegated to an inconspicuous “side chapel” that more resembles a walk-in closet than an actual chapel suitable for the worship of Christ. All Saints Parish featured another popular church alteration when it placed the choir in the sanctuary, thus taking the place of the relocated tabernacle. Over the years, parishioners have watched the abrupt morphing of the sanctuary into more or less a stage, replete with a set of drums to get the faithful on their feet and movin’ to the beat. No doubt, the freshly polished church is an inviting, cushy place, an ideal setting to foster an ethos of community. But I had to ask myself: Was the goal to mirror the set of the Oprah Winfrey Show or to construct an appropriate setting for a sacred liturgy? Preferences for the warm and cozy cannot always be lined up so nicely with the more important need for the sacred and solemn. Beyond the kitschy Merv Griffin Show look and the chintzy, cringe-worthy artistic taste that you’d expect from our dear, still-lingering-on-the-stage 1970s Catholic retreads, the problems that stem from contemporary church renovation evince a widespread ignorance of the significance of Catholic liturgy. The purpose here is not to offer an overview of the catechism (although I would strongly recommend picking one up), but to remind readers that Catholic liturgy is essentially different from Protestant worship. The latter, in the absence of Sacraments, places its prime focus on communal prayer and readings from the Gospel, while Catholic liturgy, like Orthodox liturgy, emphasize the Lord’s presence first and foremost in the Eucharist and then in the Word. (Incidentally, the Orthodox have done a much better job at preserving the harmony between theology and church architectural integrity. We can learn a lot from the East.) Catholics certainly believe that community is important, but in liturgy, community should always take a backseat to the Eucharist, the ultimate source of community and union. But how is community to be understood? Among certain Catholic pastors there has been, over the years, a concerted effort bordering on the obsessive that chooses to focus exclusively on the cultivation of a borderline narcissistic spirit of “community.” Correctly understood though, Catholic liturgy is primarily Eucharist-oriented, with community, or better, communion, flowing naturally from the Sacrament. This is why the priest and the faithful used to pray together facing the East and/or the Eucharist, what Pope Emeritus Benedict XVI has beautifully called the “liturgical East”. In this sense, community was appreciated in a richer way because everyone was praying together facing the same point of reference. But over the past several decades, thanks in no small part to piecemeal structural changes in church design, emphasis has shifted dramatically to neighbor-and-me centered activity. The renovation unveiled at All Saints reflects this tendency to magnify the importance of the community and self at the expense of the Eucharist: the relocated tabernacle, the jutted-out altar, the choir in the sanctuary, the in-the-round design, etc. Liturgy then easily becomes all about the “I” rather than the “I AM”, who is God. While still Cardinal, Benedict XVI wrote the following in his book, The Spirit of the Liturgy: “Looking at the priest has no importance. What matters is looking together toward the Lord.” And further, “The turning of the priest toward the people has turned the community into a self-closed circle.” How rich is the pope’s understanding, in contrast to that of many local priests! At most parishes, All Saints included, the priest, like the lead actor in a play, has seen fit to place himself front and center. More can be done, and certainly should be done, to ensure that in the future, Church renovations reflect the beauty of the theological underpinnings of the Liturgy. Incidentally, during the heated debates over the renovation at Saint John the Evangelist a little over a decade ago, I remember defenders of the radical project asserting that the in-the-round design has strong roots in early Christian worship, especially in ancient European churches. No, it doesn’t! Early Christian churches feature a long arcade leading into the apse, much like our cathedral in Milwaukee. The sanctuary, containing the altar, is exclusively reserved for the apisdal section of the church. In times past, the altar was usually protected by a canopy or baldacchino. (Our cathedral boasted a beautiful baldacchino, but it was demolished, gone with the wind, in the course of the, ah, “renovation” scheme.) The altar was never placed in the nave of the church. In the West, the readings took place in the bema, an elevated section within the nave, but this area was conspicuously reserved for the clergy. A screen of sorts, made of marble or wood, separated this area from the rest of the nave. Santa Sabina, one of my favorite churches in Rome, is one of the best examples of an early Christian basilica. It features these elements magnificently. Some also claim that the Byzantines/Orthodox worship in-the-round. This however, is also incorrect. The Greeks were fond of incorporating massive domes into their churches, as the centerpiece of the Greek cross layout of the church. But the domes always hovered gracefully over the nave, while the priest executed his ministerial duties in the sanctuary, hidden from view behind the iconostasis. 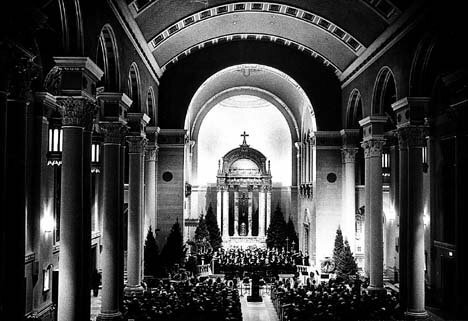 The nave, to be sure, was reserved for elaborate processions into the sanctuary, but the altar was never placed in the nave of the church, as did the Jacobin iconoclasts of our Milwaukee cathedral. Even from an architectural point of view, the in-the-round design is inappropriate and awkward because it ignores the integrity of the building’s elongated structure. It looks clumsy. A little petulant, no? End Result: Weakland, flustered by a Vatican rebuke, nonetheless marshaled his demolition crew forward. Milwaukee, let’s say “No!” to the vulgar. Let’s push back against the uninspired and their efforts to banalize and water-down our ancient artistic and theological patrimony.